Dr. Hennessy and the Orlando Executive Health team were a phenomenal addition to our Martini’s for Mammograms breast cancer awareness event @ Blue Martini Orlando last month! We are very grateful for their support as they helped to make it a pink tie affair to remember!! Orlando Executive Health (OEH) is a new type of primary care practice where the focus is strictly on YOU. Their facility was conceived, designed and built around the healthcare needs of busy people who value their time and health, but are tired of not being able to get timely appointments and sitting endlessly in waiting rooms. OEH is for people who want more time and personal attention from their physician. Read more to find out about their incredible practice… Dr. Hennessey founded Orlando Executive Health in 2005. Originally from Long Island, New York, Patrick Hennessey, MD, MPH, FACP is board certified in Internal Medicine, a Diplomate of the American Board of Internal Medicine and a Fellow of the American College of Physicians. In addition to his MD, he earned a Masters of Public Health. 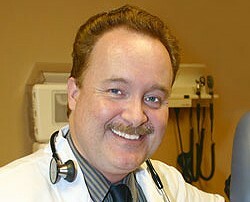 Dr. Hennessey also has advanced training in Geriatrics and Addiction Medicine. He performed his internship at the Tripler Army Medical Center in Hawaii and had a Fellowship in General Internal Medicine at Walter Reed Army Medical Center and the Uniformed Services University of Health Sciences in Washington DC, where he was also on faculty. The (OEH) philosophy is to treat every patient as a "VIP" (Very Important Patient). Most of us know what it is like to have a primary care physician who has a few thousand patients and sees hundreds each week. This often means less convenient appointment scheduling for you and time wasted in waiting rooms to see your doctor once you arrive. These doctors often don’t have the time to proactively coordinate your care with specialists when that is what you need. They rarely, if ever, are able to go with you to the specialist if that is needed, or attend to you at home if your condition makes it medically unwise for you to come to their office. Yes, (OEH) makes house calls. They will even come out to your office when that is medically necessary. In order to provide this level of care and personal attention to patients, they charge an annual fee to be a patient in the practice. This is similar in concept to the fee you pay to belong to a business club, private golf course, or one of the many VIP clubs the airlines offer. Included in this fee, you not only get more time, attention and services from your personal physician and their practice – you also get services and benefits that you would otherwise have to pay for separately or that may not even be available at a regular practice. • “Open block” scheduling. With your input, we arrange an appropriate amount of time for your appointment rather than trying to fit you into a 10 minute slot. • Coordination and facilitation of appointments and your care with specialists. • Additional services to be added according to the needs of our VIPs. We will even visit the specialist with you when appropriate. This practice is built around your needs. Dr. Hennessy and the (OEH) team are dedicated to making your experience at the doctor a remarkable one and treating you as one of their VIP’s! Learn more about (OEH) and see how they can help with your healthcare.